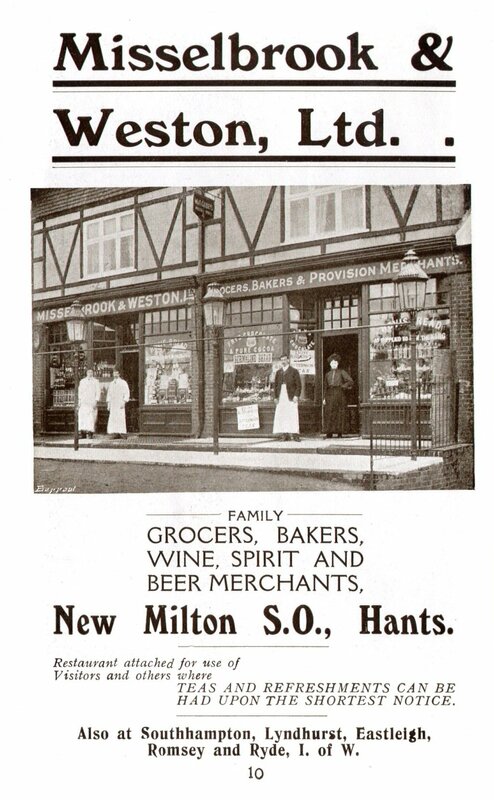 The very first shops to be constructed south of the railway line in New Milton were a grocers shop used by Misselbrook and Weston and next door, the Milton Hall. This building in its early days housed a branch of the Wilts and Dorset Bank. The M and W shop along with others in the region went on to become part of a very large chain of stores which were eventual bought out by One Stop. 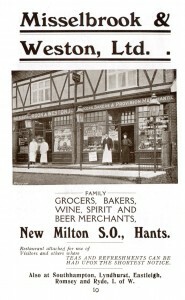 This image is taken from a 1910 advert for the New Milton Branch. The Milton Hall had a number of uses, including being a venue for public meetings and dances. The owner, Mr Hugh Wyeth and the much admired vicar, Reverend Kelsall ran a youth club here. It was used by an Estate Agent and auctioneer called Mr Skoyles who eventually sold to a Mr Foot. In later life it was used by Porter and Clarke a seed merchants and horticultural shop. Later it became a bed shop and is now used by a business selling cane furniture. 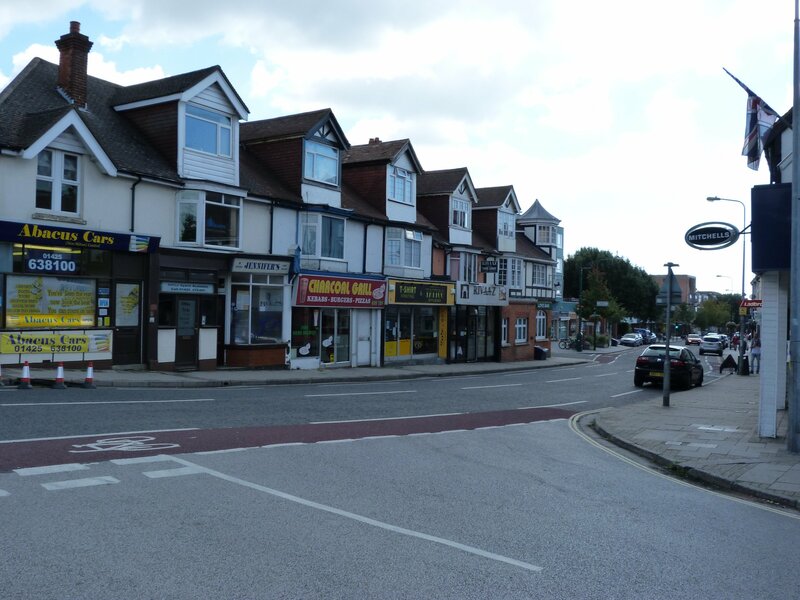 In chronological order the next shop to be built (in 1901) was the Post Office on the corner of Whitefield Road and Station Road. This was run by a Mrs Novelle who moved here from the earlier post office which was built next to Keepings Garage (now Williams Bridge Garage). For a year or so the Post Office stood on its own. This site is now occupied by Cookies corner sandwich shop. Later other shops were built from the Post Office corner heading up towards Station Approach. These included Alfred Barrow’s dairy shop, which later became a fishmongers and is now The Scarlet Studio, a ladies hairstylist. Next door was a business run by Mr Percy Beale, which later became a butchers shop owned and run by an appropriately named Mr Bull. The next shop up was Mr. John Farwell’s dairy shop and tea room. In later years this was used by Porter and Clarkes before their move across the road into Milton Hall. It is now Ladbrokes. On the corner with Station Approach was a building that was initially used by Harrisons Tobacconist but from 1910 onwards used by Mr Kirkman the chemist. He also developed photographs and sold film as well. When he moved further down Station Road to the shop which is now Costa Coffee, the premises was taken over by Alderson radio shop. It later became the New Milton Launderette. It was last used commercially by Mitchells Estate Agents, but is now empty. On the other side of Station Road there was no development until 1904 when Bank Terrace was built. Just south of the Milton Hall was Whittles Iron Mongers. This is now the site of the New Milton Health Food Shop. This photograph taken about 1907 shows the parade of shops on the east side of Station Road. 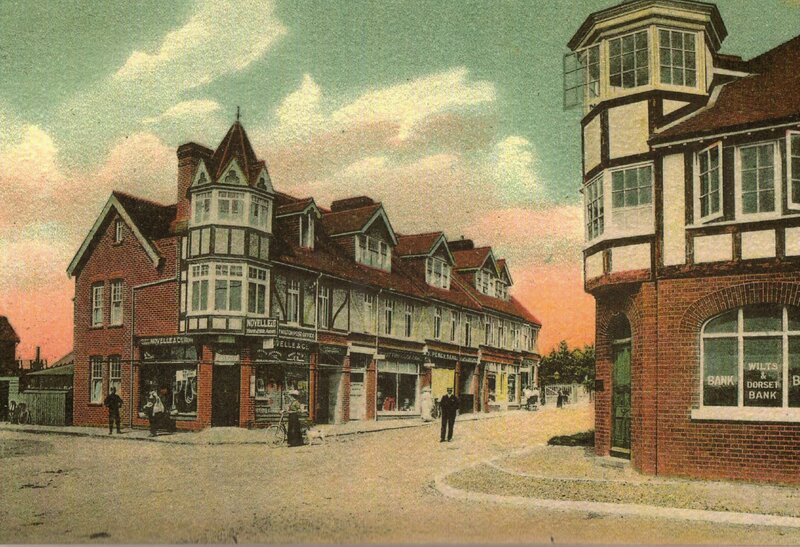 There is Matthews Watchmakers, Gore Hairdressers which was later taken over by a Mr Evans. It is still used in the same line of business now being operated as Jennifer’s ladies hair salon. 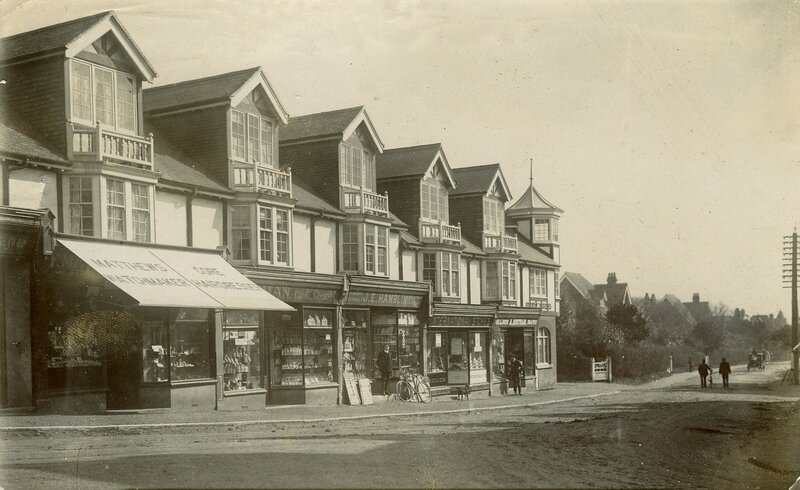 The next shop along was owned by Mr W.E Kirkman the chemist and photographer from 1907 to 1910. If you look carefully at the photograph you will notice a thumb print on the image. It is possible that this mark belongs to Mr Kirkman or his assistant who inadvertently touched the photo during the printing process. Later this shop became a delicatessen. Readers may remember that it sold all sorts of meats, hams and bacon. It also had a dried octopus hanging from a hook in the centre of the shop. Later it was used as a fishmongers, then a fish and chip shop. It is now used as the Charcoal Grill Kebab shop. Next door was a newsagent stationers and tobacconist run by J.E Hamblin. It also acted as the first library in New Milton. Much later the shop was bought by George and John Stickland who ran it until 1990 when it was sold to Balfour. It is now the Tattoo Studio. Next door was the International Stores. It later became a music shop run by a Mr Steadman but many will remember it as the Galleon Restaurant. It is now the Rivaaz Indian Restaurant. The next shop along was a drapers and milliners run by a Miss Mintram. This shop has now become part of Lloyds Bank. The bank was originally a branch of the Wilts and Dorset Bank. This bank company folded in the First World War and Lloyds Bank took over. It is interesting to note that this building has retained its original use. The bank with the Wilts and Dorset sign can be seen in the colour photo used earlier. By way of contrast with the earlier photograph here is a modern view of Bank Terrace. 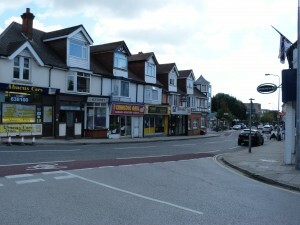 It can be seen that the earliest shops in New Milton are still providing a valuable service well over one hundred years after they first opened for business.